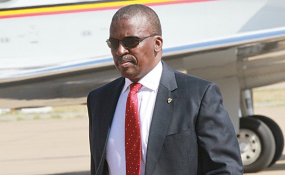 Johannesburg — Former Botswana director-general of the Directorate of Intelligence and Security (DIS) Isaac Kgosi has been arrested at the Sir Seretse Khama International Airport on his arrival from Dubai. He is facing charges related to tax evasion and corruption. In a video posted on social media during his arrest, he is seen denying the allegations and asking the police officers if they are arresting him in a public place to embarrass him. Addressing the media outside Kgosi's house the current DIS Director, General Peter Magosi, said the arrest is just the beginning and it comes weeks after a lifestyle audit was conducted on the former intelligence head by the Botswana Unified Revenue Services (BURS), the DIS and Botswana Police. "I urge you to be patient as I do not have all the answers you are looking for because the investigation is ongoing", he said to the media. When asked if he is happy with the progress of the case so far his response was yes. He also said part of the investigation required that the police conduct a search in Kgosi's home and said that they have a warrant to conducting further searches in other properties belonging to the former spy boss. Kgosi, who had been with DIS since its establishment in 2009, was fired by President Mokgweetsi Masisi in May 2018 in a move that surprised many Batswana as he was viewed as the 'most feared man' in Botswana. He gained notoriety, following allegations relating to a spate of extrajudicial killings, unlawful arrests and unexplained disappearance of suspects and abuse of state resources.